“Search failedInternal Server Error” from LDAP Management when try to search people. I have misunderstood how works the plugin. I thought searching users by lhe LDAP Management section enable to check ldap conf is ok. I will test in the right way. @st.mu You don’t search users in ldap management. 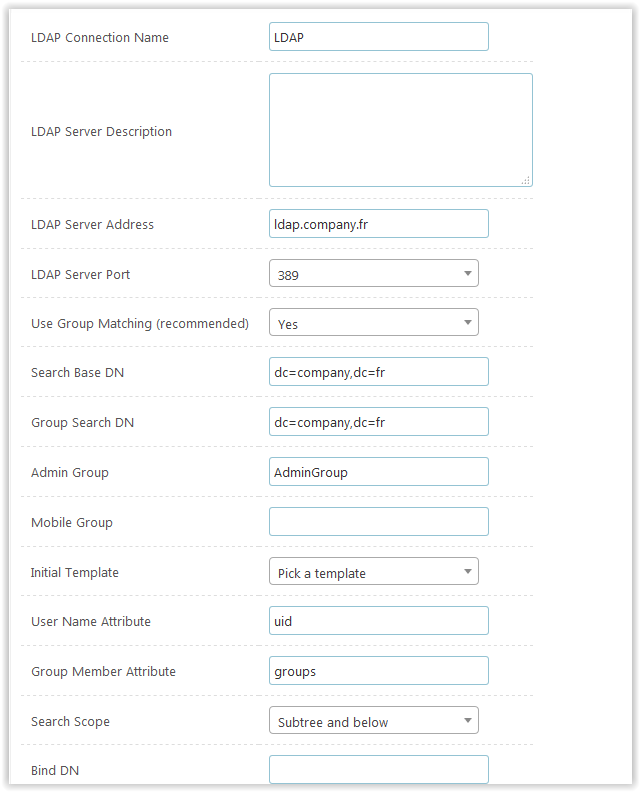 All ldap plugin does is enable you to login with LDAP user accounts, there’s no searching users. I don’t know where you got the idea that you could find users using this plugin. I’ve also tried that and it doesn’t work. @st.mu Is your Domain on an “Open LDAP” ldap tree? I’ve already seen this post. @st.mu Maybe this can help? No more errors in apach log (thanks) but I tryed many settings and ldap requests do not give an answer. I’m seeing if simply preventing autoload from occurring will fix this issue, though I still cannot replicate. I don’t think that’s the piece of code causing the problem. I run with the ldap plugin installed and have never seen this issue occur at all. Backup my test serveur from scratch, installed fog 1.4.2 and…same error. @st-mu Thanks for reporting this. Can replicate the issue. Moved to bug reports. @Tom-Elliott This piece of code is causing it… Sorry don’t have the time to look into this in detail. You right, FOG is installed on a test server and there are 2 folders fog_1.4.3 and fog_1.4.2… how to check conflicting data ? This class doesn’t exist nor has it ever. @Fernando-Gietz realized this and fixed it. FOG version 1.4.2 had this fix, so I don’t know how you can be on 1.4.2 and have this problem. I suspect you have two potential installations running with conflicting data. drwxr-xr-x 16 www-data www-data 4096 juin 19 14:23 .